Founded in 1980, Cook’s Illustrated (formerly Cook’s Magazine) has emerged as “America’s Test Kitchen,” renowned for its near-obsessive dedication to finding the optimum methods of American home cooking. 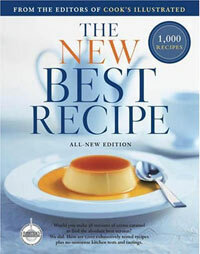 The New Best Recipe with 22 chapters and 1,000 plus recipes is double the size of the original The New Best Recipe. From appetizers to desserts, each recipe is meticulously detailed and the magazine’s trademark line drawings illustrate the techniques from the simplest to the more complex. The test chefs of Cook’s Illustrated have a knack of getting to the heart of a dish and identifying the elements that make or break a dish, and ultimately finding the ideal recipe for many of our favorite dishes. Once again the team who put this exhaustive cookbook together show us not only how to make a dish, but why it all works. Whether looking to create the finest macaroni and cheese, meat loaf, roast chicken, or brownie… and many more classic favorites, you’ll find them all in The New Best Recipe. A terrific nuts and bolts reference book to be placed alongside The Joy of Cooking on your bookshelf for easy access to anything you may want to cook.